As Manhattan succumbs to the big chain stores and tourist traps that come with the modern age, it struggles to maintain its storied identity. Fortunately for locals and visitors alike, a number of classic restaurants, shops and other establishments still thrive today that evoke the unique charm of the city. 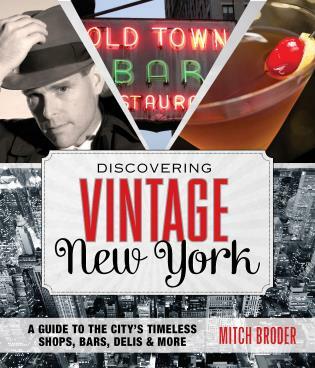 From The Four Seasons to Serendipity 3, from Katz's Deli to Café Carlyle, from the Oyster Bar to The Donut Pub, all the landmarks are here in the first and only book to collect all the best of Manhattan's timeless spots. Discovering Vintage New York is your guide to 50 profiled restaurants, shops, delis, nightspots, bars, and cafés that have lasted half a century or more. But they’re not merely old. Or historical. Or old and historical. These spots evoke a bygone metropolis. They are lost in time, yet compellingly timely. Whether they span decades or centuries, they are vibrant, quirky, and just plain fun to explore. Discovering Vintage New York takes you to a city of egg creams and knishes, of record stores and hat shops, of bohemian basements and candlelit clubs. Start reading, and start your discovering now! Mitch Broder is a prize-winning journalist who covered New York City for 20 years for Gannett Newspapers, the nation’s largest newspaper chain. He has also written for the New York Times, the Daily News, the Washington Post, the Los Angeles Times, and many other papers.